March Madness: Snow way – it’s almost here! March Madness Carnival & Dessert Silent Auction is less than two weeks away, set for Friday, March 8. With all this snow, we’re ready for a break from dreary winter! What better way to do that then enjoy an evening of carnival games, food, prizes and the Decadent Dessert Silent Auction? Wristband purchase allows for unlimited game playing and winning through the evening. Each classroom features a unique game, and students win tickets to be redeemed in the prize room. Parents, grandparents and community members are encouraged to browse the delectable dessert offerings available at the Decadent Dessert Silent Auction. You can be involved in many ways: volunteer for a shift or two at a classroom game, spread joy in the prize room, help out with serving food (pizza, cookies and chips), or lend a hand with setup and clean up. To volunteer, use the individual classroom signups (sent by email and Remind), general volunteering via http://bit.ly/pdmarch3 or contact Renee at polydrivepta@gmail.com. For more details on dessert auction donations or March Madness event sponsorships, check out the MM FAQ. Wristbands are available for purchase via flyer through March 6, at the front office through March 8, and available at the door that evening. Pre-purchased wristbands are $12 each, and will be $15 at the door. Cash or credit card payment will be accepted at the door. Pizza, chips, cookies and water are also available during March Madness. Cash, check or credit card payment may be used. Mike Thayer, a local author of children’s fantasy adventure stories, spent the afternoon at Poly on Wednesday, Sept. 25, speaking with 3rd-5th graders. His ﬁrst novel Passage to Avalon (Book 1 in The Epic Adventures of the Techno Wizard) is the story of a boy from Montana who gets transported to a strange and magical world, but still maintains cell phone signal back to Earth. During his presentation, Thayer spoke about nurturing creativity, developing a productive obsession, and shared an in-depth look at the novel writing process. His second book in this series will be released this December. 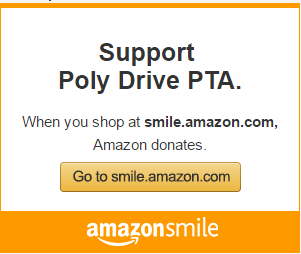 This event was made possible through donations to the Poly Drive PTA. Thank you for your support of oﬀerings like this one. Saturday Live raised $2,204 this year, which is $300 more than last year! Twelve adults and 12 students generously volunteered their time at the booth on Saturday, Sept. 22. Thank you for your time! Huge thank yous to Pizza Ranch, Play Live Nation, Chuck E Cheese and Barnes and Noble for their donations. What is it about Walk/Bike to School Week (WBTS) that triggers winter-like weather? Poly Polar Bears weren’t daunted by it, as they logged 690.96 miles, with 1,431 total trips, and 137 student participants. During the week of Oct. 8-12, kids and parents got moving through the streets surrounding Poly. Mrs. Byrd’s class won extra recess with 55.5 miles tallied in their classroom. And on the intermediate side, Mrs. Walker’s class won with 61.9 miles logged. Fantastic work, everyone! Volunteers, you take the prize for making this fun week possible. The Reflections Arts Program offers an opportunity for creative young people to participate in a themed National Arts Competition with six separate categories. Theme for Reflections: The theme for this year’s competition is Heroes Among Us; it’s the 50th anniversary. Reflections categories: The categories are Visual Arts, Photography, Dance Choreography, Music Composition, Literature, and Film Production. Who can enter? All students attending Poly Drive are eligible to enter the competition. Work is judged by age division. The Primary division is kindergarten-2nd grade. The Intermediate division is 3rd-5th grade. Do I have to buy art supplies in order for my child to participate? No. The PTA has purchased art materials that are available for students to borrow, and take home in order to create their submission piece. When is the entry deadline? Entries must be received by Friday January 18, 2019 in order to participate in the competition. What happens after the work is submitted? The entries are judged first at Poly Drive. The top two entries in each age division and category will move on to the state level Reflections competition, with the possibility of advancing to the national level. Go to http://www.montanapta.org for official rules and more information. All entries will be displayed at the Poly Drive Talent night, and at a local art gallery with an opening reception for all participating students. Make Friday night Family Fun Night on April 27. The PTA is sponsoring a STEAM (Science Technology Engineering Art and Math) Night, from 5-7 p.m. The night will feature STEAM activities that can be completed by students and their accompanying adults. Students will receive a passport to get stamped at each activity in which they participate. They may then turn in their passport to be entered in the student raffle. We will also be raffling off a new Chromebook for adults who participate in our PTA Survey. SCRaP Billings, a non-profit creative reuse center, will be on hand for an activity, as will Wise Wonders Children’s Museum. Other activites include: a math and engineering project about the membership igloo, STEM games, teepee construction, tin can flashlights, Discouraged Drawer Prevention Society, Poly Neuroscience Club, and Makerspaces. Contact Amber Erlenbusch for more information. Also that night, Poly Drive Library will host a bookfair from 4-8 p.m., with titles from Usborne Books available for purchase. Poly Drivers: It’s no mystery – Poly Readers rocks! Poly Readers wrapped up in March, and celebrated with Krispy Kreme doughnuts on March 6. Eighty students participated in 13 reading groups, with 14 reading group facilitators. Over the four to five-week time frame, the students met at lunch once per week to discuss their mystery books. PTA supplied the age-appropriate books for the program, and plans to use them in subsequent years. Thanks to all our PTA reading group facilitators, chairperson Amber Erlenbusch, and all the classroom teachers who allowed the use of their classrooms. We appreciate you all!